A local organization bringing healing to veterans and benefits to farmers received its largest donation Thursday: a refurbished tractor and monetary donation worth $27,400. The 150-horsepower tractor will increase the hands-on education opportunities for soldiers and veterans at the Servicemember Agricultural Vocation Education, or SAVE, Farm. In partnership with Kansas State University's College of Agriculture, K-State Research and Extension, and the U.S. Department of Agriculture, SAVE helps current and former military members transition to careers in agriculture. SAVE participants learn full-spectrum farming and all aspects of agribusiness, from crop care to beekeeping. Gary LaGrange, president of SAVE, said the donated tractor is important because it will allow service members to raise wheat, corn, milo, soybeans and alfalfa. 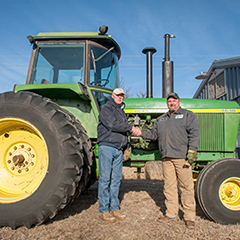 Janie Hodgson, of Quarter Moon Ranches near Emporia, donated the tractor plus $10,000. Prairieland Partners, a dealership in Emporia, provided new parts and repair work and delivery for no charge. Since SAVE's start in 2015, nearly 130 soldiers and veterans have graduated from the program. More than 20 of them are now working in agriculture, mostly for last-generation area farmers. "We match them up with a farmer who would like to have a long-term, pretrained employee, so it's a nice way to bridge the gap between transitioning military and the needs of family farms," LaGrange said. Greg Platt, a board member of SAVE and U.S. Army veteran, has struggled with post-traumatic stress disorder. He said volunteering at SAVE every day has helped him heal. Platt said other veterans working at the farm have told him they might have committed suicide if it weren't for the therapeutic benefits of serving at SAVE. "When soldiers leave the military, they often feel like they've lost their purpose, but SAVE helps keep them busy and gives them a focus that benefits themselves as well as others," Platt said. "Veterans have broken down in tears telling us how the program has literally saved their lives." One disabled veteran who completed the one-year program is now an honors student in farm management at Des Moines Area Community College in Ankeny, Iowa. The veteran said SAVE helped put his life in order and on a path toward success in agriculture. LaGrange said that success story is one of many that are made possible through SAVE. The farm project is inextricably entwined with Kansas State University because of the university's land-grant mission and agricultural roots, LaGrange said. "K-State is more than an academic institution — it's a resource that helps Kansans through practical education and mutually beneficial partnerships," LaGrange said. "I am grateful that K-State has helped make SAVE a reality."